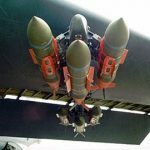 The U.S. Air Force has awarded Boeing (NYSE: BA) a two-year, $195 million contract modification to produce additional tail kits for the service branch’s Joint Direct Attack Munitions. The modification will increase the cumulative face value of a previously awarded JDAM tail kit production contract to nearly $927.5 million, the Defense Department said Thursday. Boeing said its JDAM guidance kits have a new tail section equipped with inertial navigation and global positioning systems and work to convert unguided free-fall bombs into guided “smart” weapons. The company is scheduled to finish work under the modified contract by Jan. 30, 2020. The Air force will obligate the entire modification amount at the time of award from its procurement funds for fiscal years 2016, 2017 and 2019.